I promised I would share the steel wool and vinegar stain I used to create the weathered wood boards used for our wood plank accent wall. This recipe is nothing new…it’s been around for a long time. I first saw it about 5 years ago during a google binge, since then I’ve seen different variations pop up regularly. 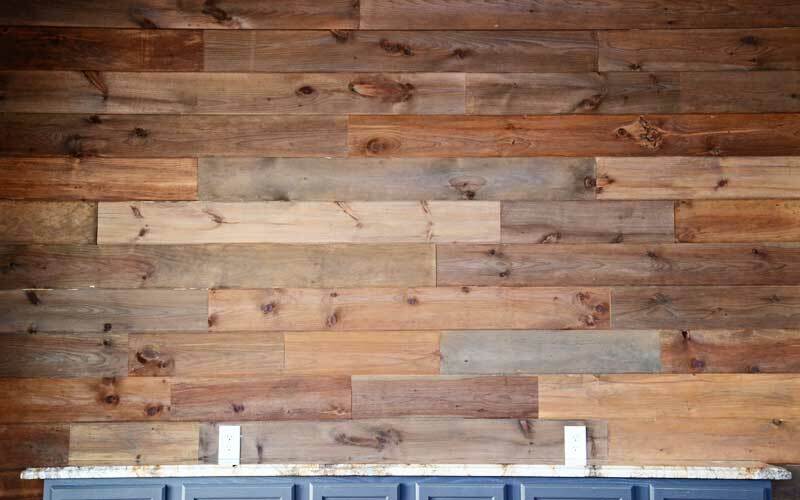 This is an easy, simple way to weather/stain board naturally. A little of this goes a long way. I used about 3 cups of vinegar and three steel wool pads for all my boards. Place the steel wool in a plastic or glass container. I recommend something with a lid so there are no accidental spills. Because this will oxidize, I added holes to the lid of the jar. (While I’ve never had it happen, nothing can dampen enthusiasm for a project more than having to clean up a vinegar and steel wool explosion!) Pour in the vinegar and let it sit. I waited 24 hours. Brew your tea. I used four tea bags for three cups of water. Brush the tea onto your boards and let them sit for about an hour. 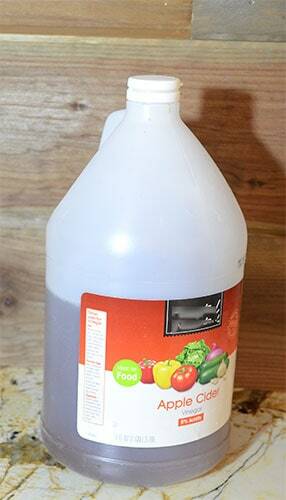 Brush the apple cider vinegar solution onto your boards. Wait for the magic! Weathered wood will appear before your very eyes! 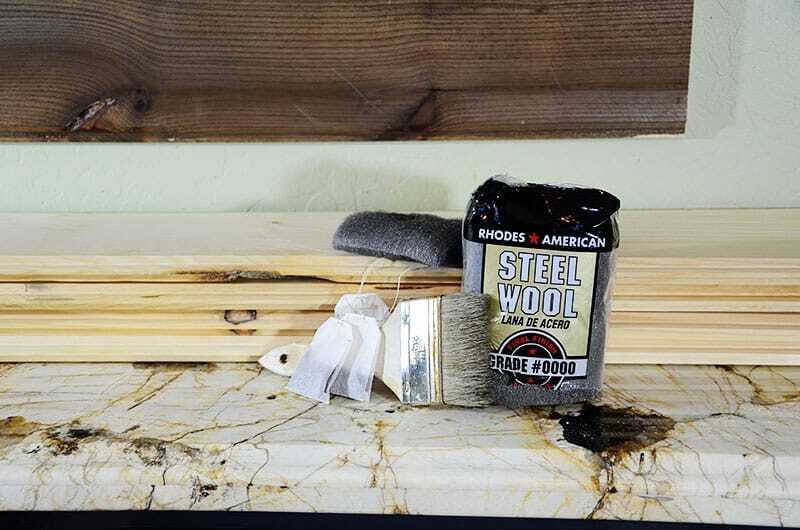 Wipe the wood when it dries because the iron acetate leaves what looks like a fine, powdery rust like residue! Apply wax or protective coating if desired. 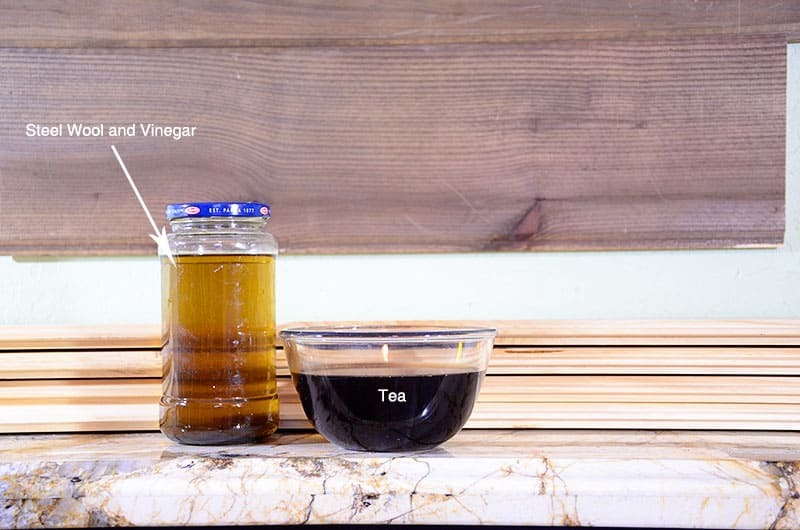 Be sure to use gloves and protect the surface you’re working on…even though it’s vinegar and tea, this stuff is strong! It stains hands, wood, plastic…you get the idea. Most wood already have naturally occurring tannin in varying degrees. 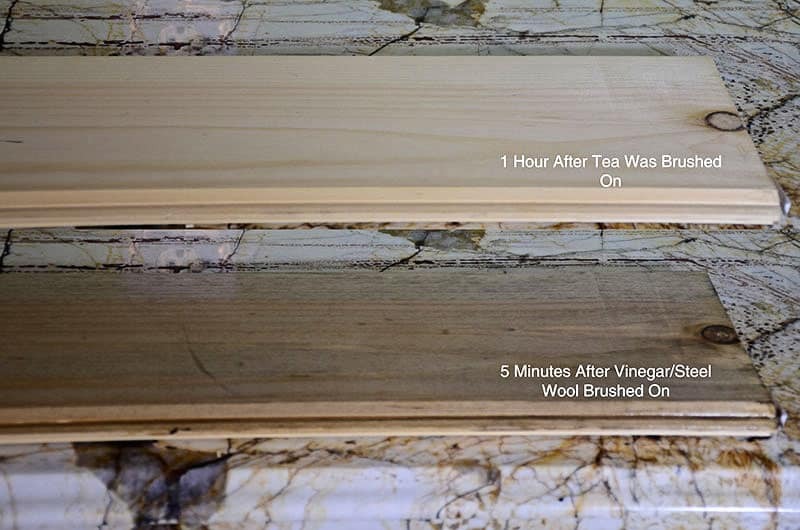 Tea has tannin and brushing your wood with the tea adds additional tannin. The more tannin, the deeper the stain. Adding the steel wool to the vinegar causing oxidization which makes the steel rust. This creates iron acetate. 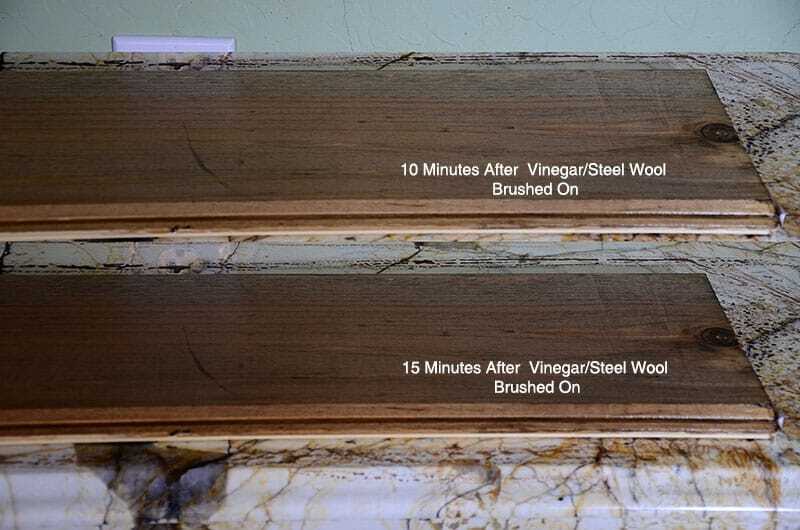 When you brush the iron acetate on the wood with the tannin, it turns the wood a dark color. This stain does not penetrate the wood deeply, so be careful if you sand. If you want a darker stain – add a bit of dark pigment! If you want a lighter color – skip the tea and just brush with the iron acetate. Be sure to test on your wood scraps before you stain the entire project. But most importantly, have fun with this and experiment, experiment, experiment! Create your own weathered wood in different shades and tones! Thanks for the tip. I am getting ready to put down a plywood plank flooring my house and I am wanting the weathered look, as I actual live in a barn that I converted to my home. This process I believe will give me the look I am needing for this project.